He held his new glass eye up to the light. I like it, he said. It has boldness. Depth. He fitted the eye and set its gaze on her, penetrating, unwavering. She said, Don’t look at me like that. I can’t help it, he said. It’s the eye. It has boldness, depth. I can’t change its expression. Then buy another one, she said. I can’t stand being looked at like that all day. It was the last one in the shipment, he said. I’d have to wait three months for another selection. They’re not easy to obtain. I can wait three months if it means I get an eye that looks at me tenderly. Can’t you order a tender eye? I don’t think they make tender eyes. Well, what are the options? Can’t say I like any of them. How about you just take it out and we live with empty for a while? Empty. Yes. That could work. Rain scuds the late-night servo. A van in a parking bay, bearded driver asleep. A car at a pump. In the shop, Mrs Mac’s pies sit in the warming box. A man in a hoodie thumbs through girlie mags under the white light. As the car leaves the pump, he fronts the counter. The attendant’s palms rise. Empty the till, says the hoodie, waving his pistol. Okay, says the attendant. It’s not. Is it? Davo? Morton Primary? Shut up and give me the money. Okay, says the attendant. I remember now. Fish paste sandwiches. When I didn’ bring me lunch, ya’d share. Ya had the best sandwiches. Meanwhile the van driver wakes, rakes his beard. Climbs down and heads for the glass doors. At the sight of the gun he backs off. Whattaya need it for, Davo? the attendant is saying. Ya hungry? I can give ya a pie. Take a pie, Davo. Go on. As the van driver pulls out his phone his hi-vis vest gleams. It catches the hoodie’s eye. He wore a suit well, she thought, despite his bulk. She left him where he lay on the floor and took her martini to the window seat. Time enough to dispose of the body. All she’d need was a stout suitcase or two. She sucked the olive off the swizzle stick and chuckled at the idea: Ding-Dong. Avon calling! Heck, that dancer was at her practice again, thump-thump-thump. She inclined an ankle this way and that, admiring her new sling backs. How peaceful it was in the apartment without his incessant carping and his dark moods. She certainly felt a whole lot better. The woman on the balcony above was reeling in her yappy dog in its ridiculous little basket. Her eyes moved up to the apartment across the courtyard. Heck, there he was at the window – the photographer with the broken leg and fashion-plate girlfriend and nothing better to do than spy on his neighbours. She switched off the lamp and lit a cigarette. When would this heat break? I love these stories. Targeted is one of my favourites from Loopholes. It make me squirm, the way some of Elizabeth Strout's stories in Olive Kittredge do. I stood on tiptoes for another glimpse. And it’s tiny. But what do you think of her? I shrugged. What’s all the fuss about? Graham said, You’re missing le point. Oh? What is le point? The mystery. The quiet. The smile that isn’t always a smile. Well. Give me Liberty with her hairy pits leading the people any day. Is this how you think I should be? Because I’m not. I’m not this. Don’t be ridiculous. It’s a 500-year-old painting! Take a look at the crowds. I know! I twirled my arms around. It’s crazy if you ask me. Sh. Keep your voice down. Ooh. Am I being too loud? Too emotional? Are my eyebrows all ugly and screwed up? Graham raised his eyes to the ornate ceiling. Aux armes! I cried, fist aloft. If you want me I’ll be at Liberty in Room 77. Driving south, to the supermarket, I see a makeshift placard on the side of the road. The choice is breaking me. It’s like learning to drive, I say. Only there’s no road. No car. No stop signs. Does that make sense? She nods, slowly. I rattle my car keys. Come on. All you have to do is put your foot on the pedal and go forward is what I mean. It’s about going forward. Oh, yes, and you can’t reverse. Ever. No looking in the rear-view mirror. So it’s not really like driving a car, is it? she says, tying her laces. Okay, it’s a clumsy metaphor, I say. Just that the idea is to go forward, not to regret things you’ve done or not done. My troubled daughter does not seem any less troubled. Anyway, I say, glancing at my watch, chocolate can be helpful too. Her mouth turns down. Just take the pressure off yourself. Enjoy life, I say. You’re only young once. I’d give my eyeteeth. Time to go. 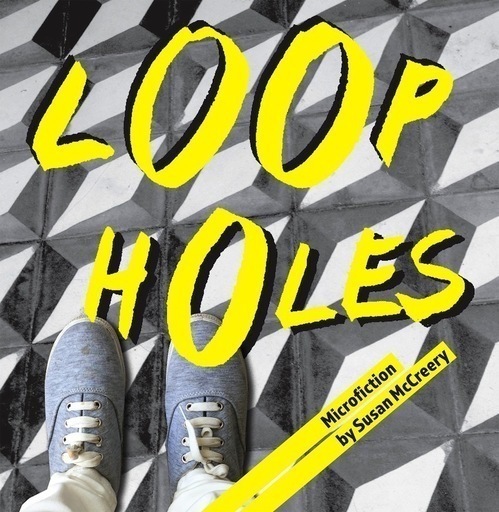 I was first drawn to Susan McCreery’s work a few years ago when I read her microfiction ‘Hold-up’ in Flashing the Square. Check it out – it’s included in this collection and it’s amazing. In the space of 172 words, she nails it. She gives us the parameters of a story and trusts us to imagine all the ways it might play out. Her use of implication is nothing short of genius. She doesn’t tell us the man is holding a gun, nor that he’s threatening the attendant behind the register – but the reader has no doubt both of these things are occurring because of those lifted palms. But it’s not just the action that drives these stories. The intimate details and close observations force McCreery’s readers to empathise with her characters – even characters whose moral compass may be skewed. That’s why she’s such a strong writer – we’re compelled to keep reading until the end and when we stop reading we’re compelled to keep thinking about the worlds she’s shown us. Here, lucky for us, we get a whole book dedicated to her work. These pieces defy categorisation. Some of them might fit under the term microfiction, while others sway towards the prose poem. McCreery’s work spans the continuum between the two, but all of the pieces here invite the reader into worlds much larger than word counts suggest. We see this in ‘Hold-up’ but it’s deftly shown to us again and again throughout Loopholes. Read ‘Lights’, where we’re given worlds of character in the minutes while a husband and wife wait at a set of traffic lights. McCreery’s use of tone and the way she spins in plot after the fact is masterful. But don’t stop there. Marvel at the tight dialogue in ‘Drought’. Appreciate the thermos that holds hot comfort in ‘Frost’. And by God, check out her verbs. They are full of purpose. And by all means, you should join the verb debate in ‘Mother’s Day’. As an immigrant to Australia, one of the things I appreciate through all of these stories is how this country – the land, the culture – reverberates through the text. Thank you to McCreery for capturing this complex and multi-faceted place and thank you to Spineless Wonders for ensuring that effort can be appreciated. This is a collection that is meant to be savoured – count yourself lucky. You’re at the beginning. You have all of these story-poems to look forward to.